If you want to taste some quality meat, in particular the traditional T-Bone Steak, in an amazing restored hamlet, among the gentle hills of the Valley of Lavino, you must go to the ‘Agriturismo La Palazzina’ in Casella Street 2, Monte San Pietro. Since about 1 year it offers fine dining very appreciated by lovers of good meat. A company founded 50 years ago with a herd of cows for meat and then grown over the years. "My grandfather Antonio - said Giordano Nanni dealing with the farm - launched about 50 years ago this farm with a herd of ten cows for meat. Then the breeding has grown in size over the years and it has now taken over by my father Armando. for meats, La Palazzina wanted to make a further step, last year it released a farmhouse that offers first-quality restaurant featuring traditional local dishes, grilled meats, an ample selection of wines, both local, and nationally and internationally known. Not forgetting the specialty: the T-Bone steak. "For a long time - he told Giordano that follows directly the farm - I had a dream: to build a farm house to complete the offer of our company by offering our products to enjoy them in a cosy environment. And so it was." In a beautiful restored hamlet customers can relax and enjoy indoors during the winter and in the veranda during the warmer months, wholesome and tasty dishes. 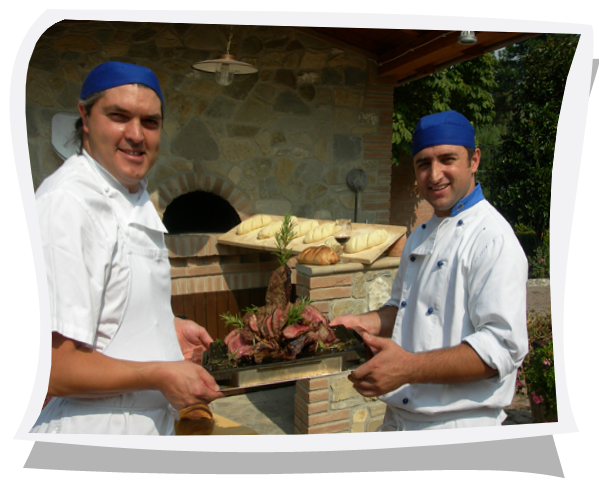 "We work with care and attention is paid to procedures and the stages in the flesh - Giordano said - without forgetting that our chef is Tuscan. Therefore to taste a good T-Bone Steak , is not necessary to go to Tuscany. Moreover there is a large offering of wines, not forgetting that we cooperate with AIES. A special objective for the future? "Our intent - they explained Armando and Giordano - is to restructure the hamlet adjacent to the restaurant to obtain rooms and apartments for overnight guests, with the goal of completing the offer farm. We also want to make a camping accommodation.